A regular hexagon has a radius of . Find the perimeter. The only information given in the problem is the radius. From the radius, we are expected to solve for the perimeter. But in order to do so, we have to go through a few small steps. The initial goal is to solve for the length of one of the sides. Once one of the sides has been found, the perimeter can be solved for by multiplying the side length by the number of sides ( ). In order to solve for the side (or as some call it, the base side), we can use right triangles. The first step is to solve for the internal angles of the hexagon. This can be solved through , where is the number of sides. This angle gets bisected in the right triangle we can draw using the radius. This means that the bottom right corner of the figure is . Now that we have one side and one angle measure, we can solve for the base of the triangle in one of two ways. Using the rules of the 30/60/90 triangle, where the hypotenuse equals the value and the side opposite of (in this case, our base) is . Because , this means that our base is ; however, because the base of the triangle only makes up half of the length of a side, this means that the side length is actually . If the side of a hexagon has a length of , what is the perimeter of the hexagon? Substitute the side length and solve for the perimeter. If the side length of a hexagon is , what is the perimeter? Write the perimeter formula for a hexagon. Substitute the side length and solve. What is the perimeter of a hexagon if a side length is ? A hexagon has 6 sides. If the lengh of a side of a hexagon is , what is the perimeter? Write the formula for the perimeter of a hexagon. Substitute the side and simplify. If the side of a hexagon is , what is the perimeter of the hexagon? Write the perimeter formula for a hexagon, substitute the side length, and simplify. Remember to distribute the 6 through to all parts within the parentheses. If the side length of hexagon is , what is the perimeter of the hexagon? Write the formula for the perimeter of a hexagon, substitute the length of the side, and simplify. Suppose the two side lengths of a hexagon added to . What is the overall perimeter of the hexagon? 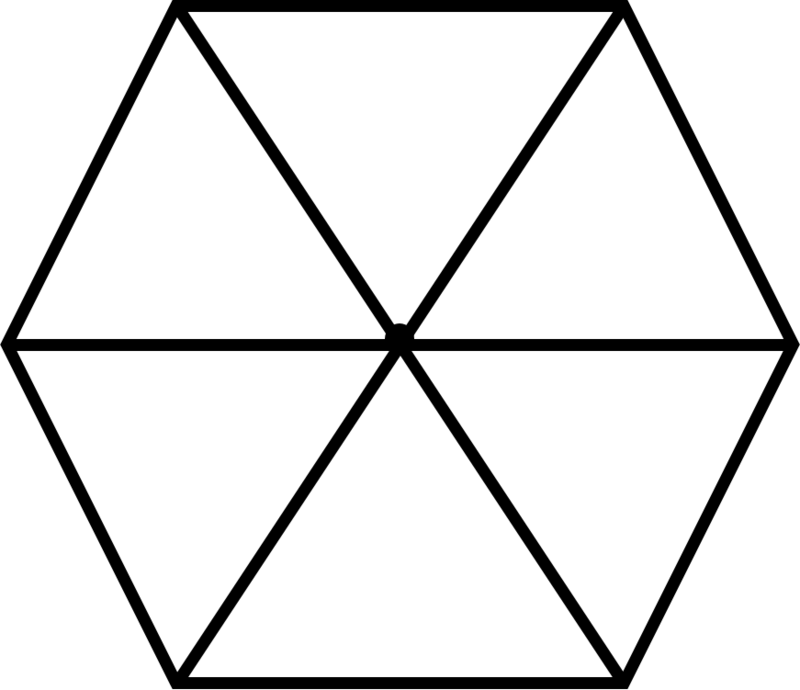 Since equals two sides of a hexagon, one side will have a length of . Substitute this length into the perimeter formula and evaluate. If the side of a hexagon is , what is the perimeter? Substitute the length into the hexagon perimeter formula and simplify. Remember to distribute the 6 to all parts within the parentheses. Find the perimeter of the regular hexagon. 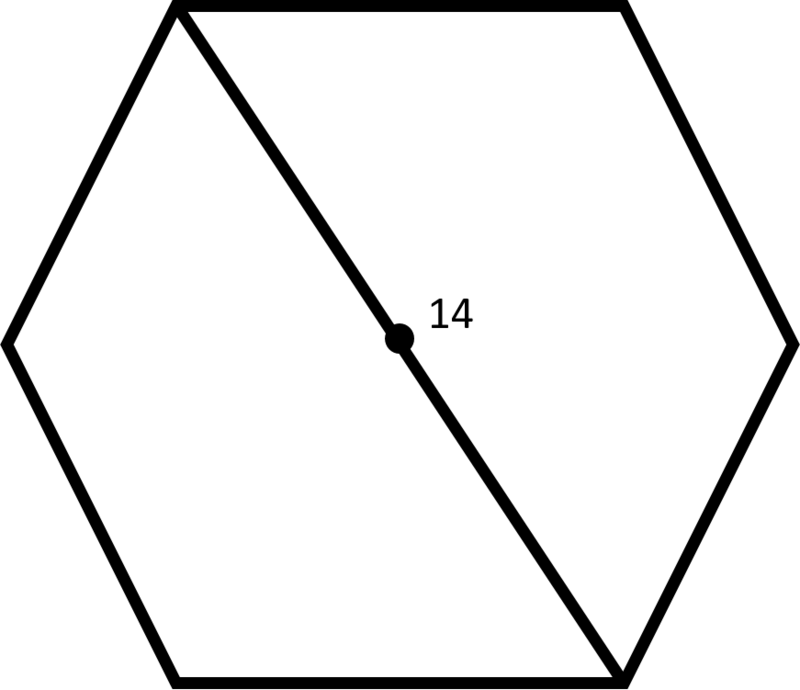 Thus, the diagonal of the hexagon is twice the length of a side. Plug in the given diagonal to find the length of a side. Plug in the side length to find the perimeter.